Vacancies have gone up again in residential properties. That was one finding of the 2019 real estate study by Credit Suisse. Despite this, real estate prices are still rising. Here's what's behind this development. 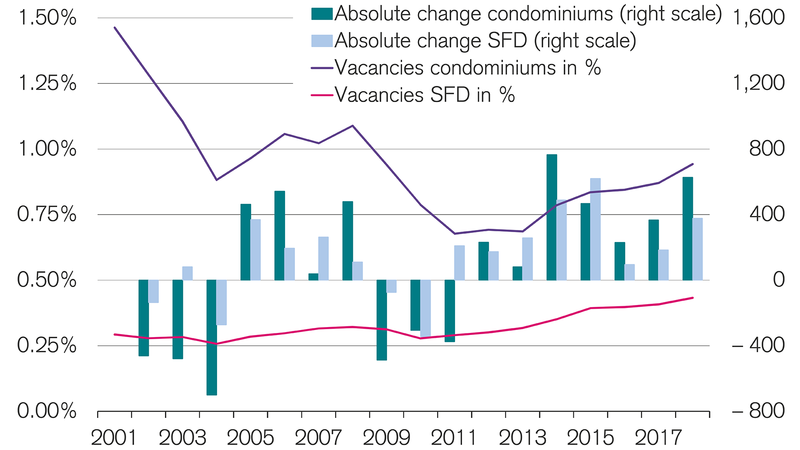 Vacancies went up significantly in residential properties in 2018, both for condominiums and single-family dwellings. The vacancy rates are still moderate, though. Condominiums are just under the 1% threshold at 0.94%, and the rate for single-family dwellings is still low at 0.43%. There were thus 6,529 vacant condominiums as of June 1, 2018. The figure for single-family dwellings was 6,041. The primary contributors to this increase in vacancies were small and medium-sized urban centers, including their outskirts. Rising prices are making it increasingly difficult for households to make their dream of home ownership come true even in these areas, however. By far the highest vacancy rates are being reported in the touristy mountain regions, though. The reasons for this are the delayed consequences of the second home initiative and the sharp appreciation of the Swiss franc, which has scared foreign buyers off in recent years. In contrast, vacancies are on the decline in the countryside. Could the large glut of rental property encroach on the market for residential properties? The Credit Suisse real estate study provides answers to this as well as other questions. The rise in vacancies should not be blown out of proportion. After all, there is still widespread interest in residential property thanks to low mortgage interest rates. The high price level and the high qualification standards mean that fewer households are still able to make their dreams of home ownership come true. At the same time, construction activity has dropped significantly for owner-occupied properties in recent years. Both of these factors have allowed residential property prices to rise further almost everywhere in Switzerland in 2018. This increase was 1.7% for average-sized condominiums and 3.4% for single-family dwellings. Price growth has tapered off a bit over the course of the year and has been fairly even across the various price segments during this time. 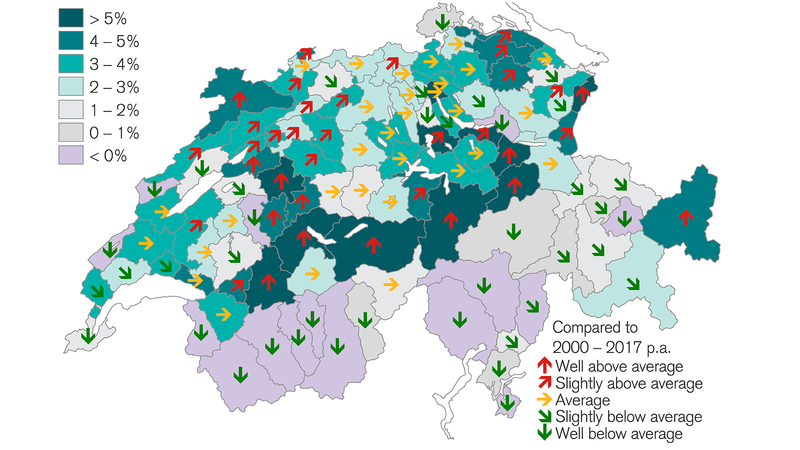 Real estate prices fell only in the cantons of Valais and Ticino. In Valais, this can be attributed to the continued sluggishness of the vacation home market, which saw only slight price growth in Graubünden as well. In contrast, weaker immigration from Italy has led to negative price development in Ticino. Home ownership is extremely attractive right now thanks to low mortgage interest rates. Our calculator will show you whether it is cheaper for you to rent or buy. The experts at Credit Suisse presume the good market environment will continue in 2019, albeit with slightly weaker price dynamics. Despite the fact that mortgage interest rates are still very low and are thus ensuring sustained demand, this is being undermined by high real estate prices and strict regulatory measures. Credit Suisse's experts are projecting a gain of 1.0% for condominiums and 2.0% for single-family dwellings. With the recent increase in real estate prices, the disconnect between real estate pricing and income development has grown slightly again. The price corrections in 2016 and 2017 provided relief for just a short period of time. The disparity has widened again now. This trend is likely to persist as long as mortgage interest rates remain low. As a result, regulatory pressure will not let up either. Are you interested in additional findings from the real estate study? Or do you have any questions about buying your own home? Call us at 0844 100 114 or schedule a personal consultation. Is active Real estate prices are on the rise. Despite higher vacancy rates.